The phrase “on the ground” morphed into cliche eons ago. There are no signs, though, that it is fading from the language. Instead, more and more of our newscasters, policy makers, military leaders, and talking heads use it. When they do, they establish the vast distance between their insulated offices and those who are face to face with the consequences of disasters, war, and political decisions. I am not a fan of this phrase. However, if used literally — if used, say, to describe what I have found when I looked at the actual ground, I can feel the words perk up. The phrase “on the ground” straightens its shoulders and does the simple yet useful job it was always meant to do. 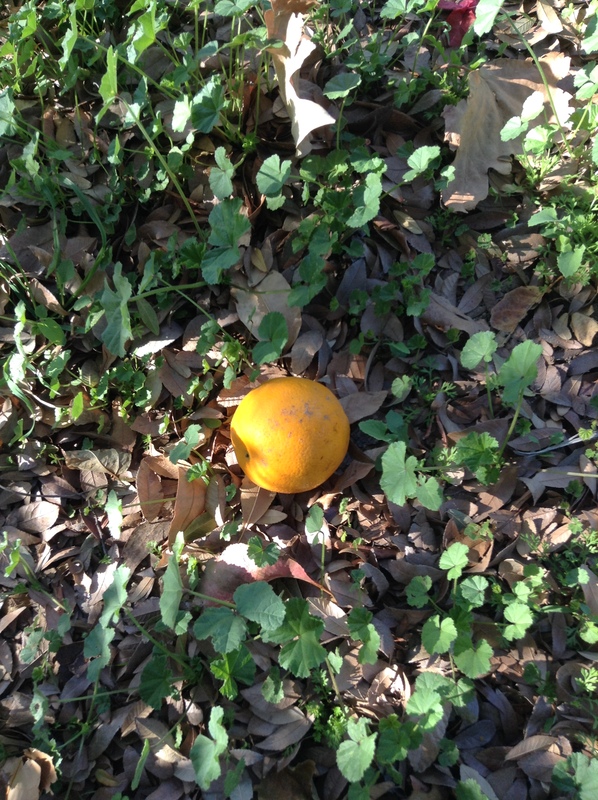 I found this orange on the ground as I trudged in unseasonable heat near my stepdaughter’s house. I was thirsty. I had looked longingly at the branches full of fruit hanging just out of reach over the walls that lined the sidewalk. I heard a muffled “whump” and looked back, then down. There it was. When my feet move along the surface of the ground, I can read the changes through the soles of my shoes. There is the give of a dirt path, the unyielding concrete of a sidewalk, the slippery squish of wet leaves, or the grit and sink of walking in sand. Look down and the ground becomes a canvas that stretches out in all directions. 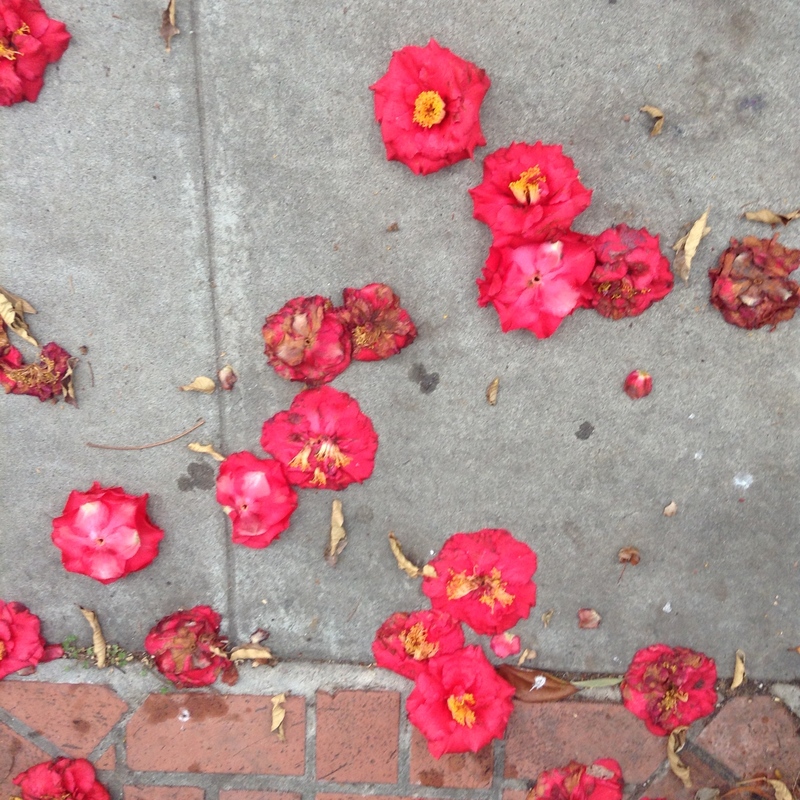 Camellia blossoms die a beautiful death in one corner. 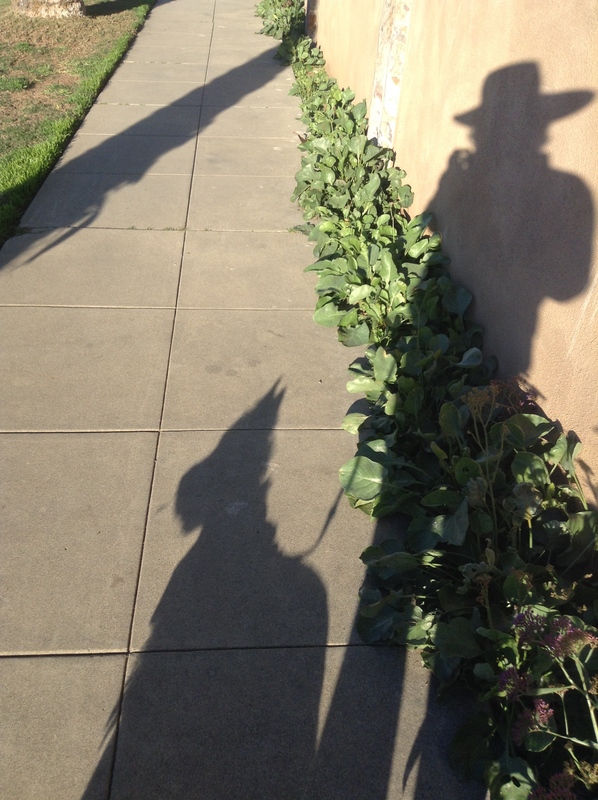 A sunny sidewalk captures the shadow I make when I walk my dog and reminds me that I really must look insane in that hat. 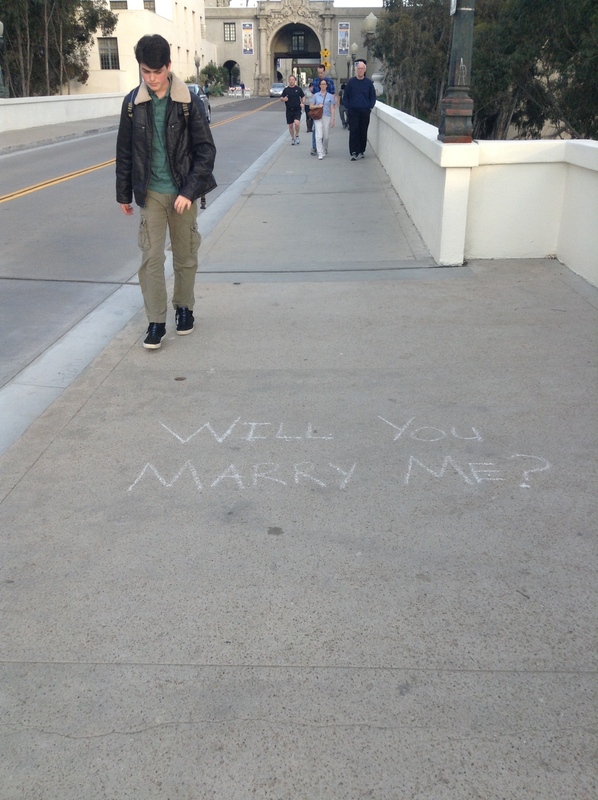 A walk in Balboa Park reveals a message scrawled in chalk that makes me wonder how it was answered. I’ll never know. 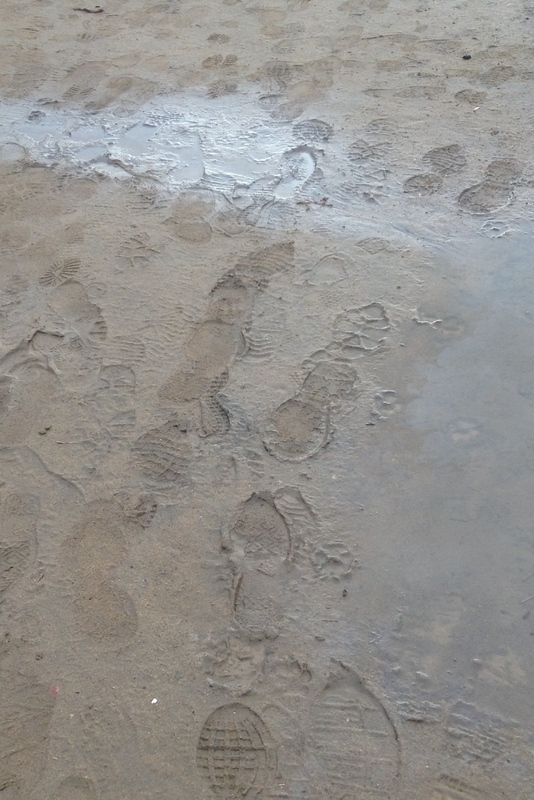 And of course the ground is peppered with the scuff marks and foot steps of those who have traveled before me. Their prints are there along with the scratchings and droppings left by birds, lizards, rats, dogs, or other animals that share common ground with me. I think sometimes of people who lived here years before any of us did and relied upon the signs they found on the ground that led them to food or helped them to avoid danger. When I think about this, I feel the vast distance that still exists between me and all that lives beneath the soles of my well-shod feet. Walking on the ground still keeps me well above it. Perhaps I’m too quick to dismiss the news anchors, talking heads, and the others who operate far away from the consequences of all of the ways we humans mark our ground. Pamela thanks for clarifying the military use of the phrase. It does the job there too. Where it gets problematic for me is when I hear it from news people and the experts they consult on everything from Christmas shopping to what happened in Ferguson or Boston. The reporters are now the ones “on the ground” or close to the action whatever it is. You are here for the rain which of course is a blessing. Glad to hear you made it out west for a brief respite. Enjoy! Betsy, I don’t mind the phrase and I often take photos of what’s on the ground–a pattern of leaves or a shadow shot–but I’ve never thought of a series of photos of what’s on the ground. And I find that so interesting here. You’ve made me think about the ground in a whole new way. Reading this post was like meditating on the blessings of being a human walking the grounds of Mother Earth. Simply lovely.